Precision ag keeps getting smarter. From hardware that can track and provide insights into your in-field processes to software that can help turn data into actionable information for year-over-year improvements, the modern farm looks much different than our parents’ farms. Listening to feedback from farmers, we’ve learned what we got right and what we got wrong. We’ve taken the feedback and revamped Precision-IQ with the core functionality our farmers need. New versions of the application will tackle the biggest challenges our users face, such as labor shortages and the ever-increasing need for greater efficiency and productivity. With this strengthened foundation in place, we’re poised to build a product that revolutionizes the farm of the future, regardless of size. The farm of the future ties the entire operational cycle together with information from each season flowing into and informing the next. This allows us to make better decisions in an era when our farms are heavily impacted by outside influences like dropping commodity prices, agricultural tariffs, and mother nature’s unpredictability. Precision-IQ arms you with actionable data to put some control back in your hands, both in real time and the long term. 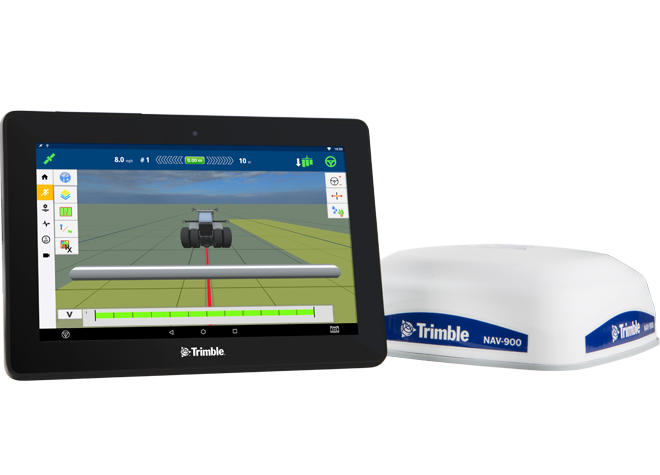 The Trimble® Precision-IQ™ field application for our TMX-2050 and GFX-750 displays is an easy-to-use advanced field management system. This application gives you the ability to collect and manage the information and data from infield activities and then analyze that data back in the office using your farm management software. For legacy farmers familiar with the capabilities of FmX® Plus and for those new to Trimble — now is the time to look at Precision-IQ. The Run Screen Pattern Selector allows you to cycle through your library of AB lines and curves without having to leave the run screen. Similar to a feature that FmX® Plus users will be familiar with, this gives you a quick way to change guidance lines from one to the next based on your location and the needs of your operation. Easily filter down to fields of a specific client or farm. Organize your data by farm and field name for quick lookup and easy access to their fields when onsite. No more scrolling through long lists of fields to find the one you’re currently working. Be confident that you’re spraying when and where you intended with a switch box you control and can monitor to make sure switches engage at the right time. This feature allows for modules for “Field-IQ Basic Rate Only” or “Section Only” to be unlocked to a Rate and Section module to give you greater control, flexibility and control over your application processes. Designed for crops that live in beds and creep and move, access paths give you the ability to create a repetitive skip in your fieldset. Protect your vines by giving your sprayer the room it needs to do its job without stepping on your crops. Choose to guide to your swath set or to your access paths. This out-of-the-box functionality for the Trimble® GFX-750™ display system display system is now available for TMX-2050 Precision-IQ users. Easily know when your implement is up and when your implement is down. This allows you to automatically start coverage logging based on the positioning of your implement’s 3-point hitch. This feature provides coverage logging accuracy you can trust with as much or as little control and detail as you need. Define coverage and data capture parameters within your implement setup. Want to take your precision ag practices to the next level? Now is the time to think about upgrading your TMX-2050 with Precision-IQ or to purchase a new GFX-750 or TMX-2050 with Precision-IQ pre-installed. Precision-IQ is easy to use for any operator. It’s simple, straightforward and requires little to no training to get anyone on your crew up and running. We are always listening to farmers about innovating and improving our technology. This ensures our solutions serve customer needs based on the way you want to farm today and in the future. Precision-IQ is the foundation to a platform you can trust to grow and change with your farming needs. When you invest in your farm using Trimble products, you’re getting the support and resources of a worldwide network of precision ag experts. Our resellers are fellow farmers and agriculture advocates living in your community who are eager to help you improve your farming practices. They’ll get you more time back to spend with your family and make your profession more enjoyable with the assistance of world-class precision ag technology. To learn more about our innovative yet intuitive display, view a video demo of the GFX-750 display system.